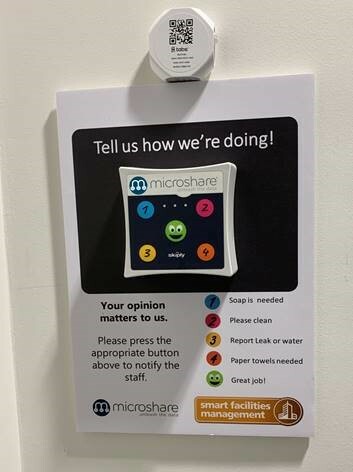 by Brianna Crandall — April 8, 2019 — UK-based FM solutions provider Microshare announced at last week’s National Facilities Management & Technology (NFMT19) Conference and Exposition in Baltimore that its ready-to-deploy, IT-free IoT Bathroom Predictive Cleaning Solutions are now available in all US markets. As the Internet of Things (IoT) continues to prove that data leads to smart buildings, US facilities managers (FMs) are looking for innovative solutions to improve operational efficiencies, lower costs, and increase client customer satisfaction. Dependent on scheduled cleaning and maintenance cycles, and often saddled with crisis management, FMs may have difficulty allocating resources effectively and anticipating issues before they become disasters. Without clear data, they may be unable to make good decisions, and can be stuck with inefficient processes and costly procedures. To empower FMs in their planning, Microshare, which has been providing FM solutions in the UK and EU, has brought its Bathroom Predictive Cleaning Solutions to the United States. The PCSs offer cost-efficient, centralized, and comprehensive views of how facilities are being used, providing real-time data and allowing property managers, facilities managers and cleaning contractors to analyze trends to improve comfort and satisfaction, and to receive alerts as soon as potential issues occur. The solutions can also improve productivity by making digital the janitor attendance record and removing the need for paper attendance sheets. These immediate insights are intended to create better FM productivity and customer service for restroom cleaning for airports, offices, shopping malls, schools, healthcare providers, and everything in between. The data produced from the Microshare IoT sensors has enabled us to rethink how we schedule the cleaning services to offer an enhanced customer experience. We can now clearly see the trend of when demand peaks, and have been able to respond by putting a robust cleaning schedule in place that can flex with these peaks. Microshare offers the PCS kits as an easy-to-buy service, with no upfront investment, that can be up and running in less than a day — with no involvement from the information technology (IT) department. And, because they utilize the open Low-Power, Longrange LoRaWAN network from Comcast MachineQ, they operate off any corporate network, reportedly posing no security risks. The system includes a wall plate with a sensor that gets mounted to a restroom wall. Users of the restroom can simply push a button on the wall plate to notify the FM or custodial staff that attention is needed in the restroom (e.g., more soap or paper towels, a plugged toilet, a leak, etc.). A signal is then sent through the wireless to the FM. Thanks to the LoRaWAN network, the wireless is long-range and is able to reach the FM even if it has to be transmitted through thick walls and slabs. The solution can also easily be extended to other FM areas such as temperature and humidity monitoring or desk and meeting room occupancy, utilizing the same infrastructure and reducing costs. There is no wiring required, so the PCS kits can be used in any facility. Microshare enables data owners to extract amplified value from digital assets by empowering them to combine data stores for actionable insight, establish and enforce sharing rights to distribute information, and monetize data for new revenue streams and business models — all with complete audit, compliance and control, says the company. Microshare is part of the LoRa Alliance, promoting the LoRaWAN protocol as the leading open global standard for secure, carrier-grade IoT Low-Power Wide Area Network (LPWAN) connectivity. Microshare has offices in Philadelphia, PA, and in the United Kingdom. Survey finds Americans choose hand washing over hand sanitizers to avoid the flu, but may skip washing if sinks are dirty or lack supplies March 8, 2019 In "Surveys and Trends"
When you need to quickly clear tough blockages in toilets and urinals, check out these new toilet augers with power option May 4, 2018 In "Products and Services » Restroom Equipment and Supplies"
If you want to reduce paper towel and toilet clogging, take a look at these sleek new dispensers June 20, 2018 In "Products and Services » Restroom Equipment and Supplies"
Trying to reduce slips and messes from water spills on your restroom floors? See what Dyson has come up with July 18, 2018 In "Products and Services » Restroom Equipment and Supplies"